The world has been devastated by wars- and Japan has been the worst victim of it with Hiroshima and Nagasaki finding the attack of two atom bombs during the World War II. As a result of it, Soka Gakkai International, a local organization has always taken he pledge forward and has tried to demonstrate peace all over the world. 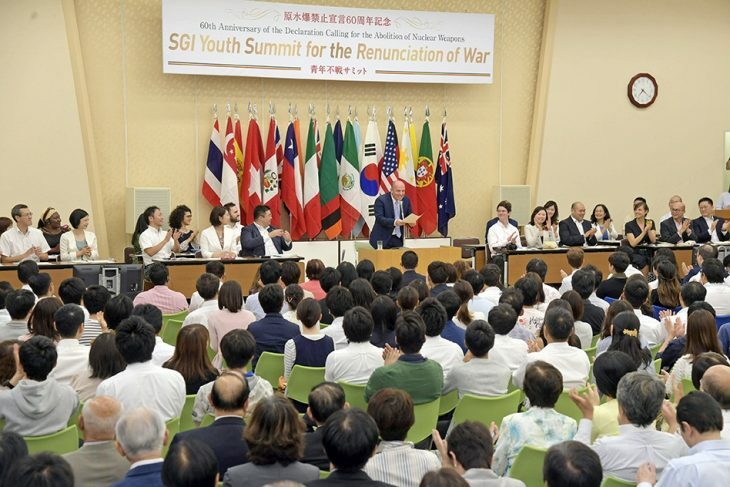 As of now, on 2nd September, the SGI Youth who has been representing thirty different countries across the world has gathered more than 540 attendants along with some of the distinguished personalities for the SGI Youth Summit, the sole aim of which is the renunciation of war. Now, why is this particular day chosen? Going down in the books of history says that sixty years ago, on this day, then President of Soka Gakkai International, Jodei Toda had made the historic declaration of the Abolition of Nuclear Weapons in front of the entire crowd in Japan. Hence, they have taken up this special day to commemorate that significant event and hence take the bold step forward towards the renunciation of violence and war in the rest of the world. The current SGI President, Ikeda is highly impressed and motivated from what his ancestors have shown this world. And he keeps harnessing on the thoughts that all lives have got the right to exist on this planet hence SGI has taken up the mission each and every life that is being distressed. It is really a positive sign that the modern day youth also finds some involvement in this mission and that proves to be promising enough to give the world a better future. To give the entire world an instance, they have even invited one of the survivors from the Hiroshima Nagasaki bombing, Kimio Hattori, who still finds life even at the age of 91. While he was asked to speak a few words about his experience, he says that he was only of 19 years when he realized how cruel the world and mankind could get. As he was stationed at the army base in Hiroshima, he heard of some aircrafts hovering over the city and thought of coming out and see what’s going on. And it was right in front of his eyes that he saw his world ripping apart and catching blazing flames with a black gust of fear and uncertainty covering the entire city. It’s time that this entire raging nature of the world needs to be changed and people start loving their life and this planet. However, preaching peace could be the only way out. They have even adhered to the Soka Gakkai Songs whose lyrics stand to be the embodiment of love and peace. Each and every day of the present determines how the future will be, and since the youth is responsible for this, they must take it seriously and mend the path for a better future, not just for them, but also for their future generations.